WE STRIVE TO MAINTAIN THE BEST PRICES IN THE INDUSTRY AND VALUE YOUR BUSINESS. 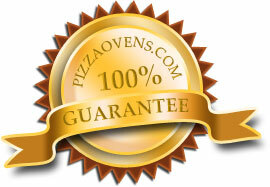 Pizzaovens Inc warrants that all of our products to be free from any defect in material and workmanship. We want your 100% satisfaction. This warranty becomes valid upon completion of Supervised and Documented Installation of the Equipment performed by a CERTIFIED SERVICE CENTER within 14 days of receipt of goods. Warranty does not cover any failures that are a direct result of shipping, handling, fire, water damage (flood), accident, misuse, abuse, improper or inadequate maintenance, acts of God, attempted repair by unauthorized persons, improper installation, use of non- genuine (generic) replacement parts, improper or inadequate utility supply and/or ventilation. Under no circumstances will we be liable for any loss, lost revenue, damage, direct or consequential, or for damages in the nature of penalties arising out of the use, or inability to use any of the products. In no event shall Seller be liable for a sum is excess of the purchase price of the item. Seller shall not be liable for any prospective or lost profits of Buyer. EXPENSE INCURRED IN REPLACING OR REPAIRING SUCH PART. SUCH WARRANTY SHALL BE LIMITED TO THE ORIGINAL PURCHASER ONLY AND SHALL BE EFFECTIVE FOR A PERIOD OF SIX MONTHS FROM DATE OF PURCHASE [unless otherwise specified and agreed], PROVIDED THAT TERMS OF PAYMENT HAVE BEEN FULLY MET. Pizzaovens.com shall be responsible only for repairs and/or replacements of defective parts performed by Seller's authorized service personnel. Failure to call Pizzaovens.com at (877-367-6836) prior to contacting a repair company for warranty work voids any and all warranties. Authorized service agencies are located in principal cities throughout the contiguous United States, Alaska and Hawaii. For full terms and conditions click here for Labor Warranty Information. The foregoing warranty is exclusive and in lieu of all other warranties, expressed or implied. There are no implied warranties of merchantability or of fitness for a particular purpose. In the unlikely event a unit is beyond repair or customer may be dissatisfied with the product, the said unit may be returned for exchange, repair or full refund excluding all transportation charges. This offer is limited to goods returned to us within 21 days of receipt and must be pre-approved. This does not cover any failures that are a direct result of shipping, handling, fire, water damage (flood), accident, misuse, abuse, improper or inadequate maintenance, acts of God, attempted repair by unauthorized persons, improper installation, use of non-genuine (generic) replacement parts, improper or inadequate utility supply and/or ventilation. Normal maintenance functions, including lubrication, cleaning or customer abuse are not covered by this Worry Free Warranty.